Best-Selling Author Dr.Afshan N.Hashmi spreading, inspiration, love & happiness! what consulting services I offer ! I am not on this channel effective July 22 2018: Effective April 1st, 2018 Global Television Network will NO longer transmit & telecast on MHZ 1 Networks. Please note that Global Television Network will now transmit & broadcast all shows from WJAL LATV (transmits from Washington, DC.). These GTV Shows will telecast weekly on Saturday’s & Sunday’s:-10:30am to 12:30pm. My TV Show Glam World With Dr. Afshan Hashmi on weeks 1 & 2 on Women’s Worldview on Sunday’s at 10:30. AM WJAL LATV. For the past 31 years, Global Television Network Inc. (GTV) broadcasted on MHZ 1 Networks which caters to a viewership of 2.1 million homes. WJAL LATV is known to be the “Power House” for broadcasting Nationwide & reaches 6.2 million homes throughout the Washington Metro DC Region. Global Television Network continues to serve all globally by broadcasting local news & global perspectives which unites all. Each host with his or her thoughts, ideas & an exhibition of his or her talent on screen stands to be a mutual benefit for everyone. 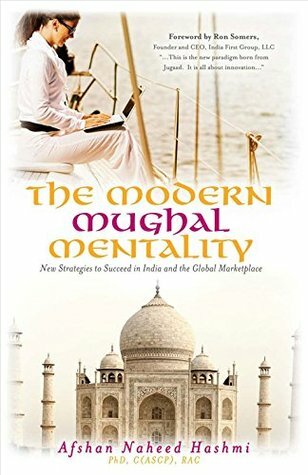 My Book Name: "The Modern Mughal Mentality-New Strategies to Succeed in India and the Global Marketplace" is on Hindi buzzword Jugaad. Jugaad is about Creativity and Innovation. given to my book you have to read my book. in e-book and print formats. Welcome to my "Book Author related work" website!!! Thanks a lot for visiting my website.I dedicate this website and all the knowledge I have gained till now to my first mentors and teachers my sweet maternal grandpa Prof.Abdul Aleem and my sweet parents Jamila and Prof.A.Majid Siddiqi. Although they have left for their Heavenly abode but their noble teachings will always guide me. Above: Dr.Afshan Hashmi( Right) with Honorable Sridharan Madhusudhanan(Left) , Minister(Press, Information & Culture)Embassy of India in Washington DC. showcasing Dr.Afshan Hashmi's book The Modern Mughal Mentality. Elevator Pitch of Author Dr. Afshan Naheed Hashmi-Know Dr.Afshan Naheed Hashmi in 10 Seconds! Dr.Afshan Naheed Hashmi born in India and educated both in India and USA now lives in Rockville, Maryland,USA with her wonderful and handsome husband Mr.S.A.Mustafa Hashmi. Mustafa Hashmi is a Pediatrics and Neonatal Respiratory Therapist and Dr.Hashmi met him while she was studying in India. Dr. Hashmi is an author, award-winning entrepreneur,speaker, educator, books, movies, make-up and beauty products Reviewer, film critic and Radio Show as well as TV show Host, is a successful regulatory, business development and scientific professional with more than a decade of experience. Dr.Hashmi has a reach of over one billion people via print, TV and online!!! Dr.Hashmi belongs to one of the most prestigious families of India. She is very proud of her royal family heritage and legacy. Not a single day has passed since my childhood where I have not written something!!! My first writing was published in a magazine in India when I was 8 years old!!! Book writing is a very relaxing art for me !!! So keeping up with that relaxing mood you can hear some nice music audio tracks I have embedded in this website!!! But if you like to go through website without listening to this soothing music then just hit the stop button on the streaming player shown at the bottom of the page!!! I have written my first book "The Modern Mughal Mentality:New Strategies to Succeed in India and the Global Marketplace"
For more details about this book please visit the link on this website entitled "Books Authored by Dr. Afshan Hashmi". This site is dedicated to my author related endeavors. My book is available in both online and print formats and it is available everywhere where books are sold. Also, keep visiting this site for latest updates. Please browse through the site and do connect with me with your thoughts.I believe in the mantra to teach and write in very simple language. I am passionate about sharing my knowledge. Also please sign-up for my Newsletter to get interesting,intellectual and spicy news from me. My second book will be a science fiction which I will start writing soon. But each page of the book will be open for sponsorship. To know more about this project please contact me via my email and also visit the link Books Authored by Dr. Afshan Hashmi.